This landscape starts at Black Bay, just north of Byng Inlet and stretches north to the Key River. At this point the shoreline of Georgian Bay turns to the west, but the various outlets of the French River, the Bad River and the Pickerel River all run from north to south. On the Voyager Channel the family of Robert Desrochers has a homestead on Cochon Island. Robert’s uncle Gilbert Desrochers, once tried to get off Cochon Island by taking a barge, which he subsequently wrecked in the Bad River rapids. He ended up in jail and after his release he decided to live behind his brother’s barn near Perkinsfield at the south end of Georgian Bay. Here Gilbert created a world of carved animals and figures, a peaceable kingdom, and a personal refuge. 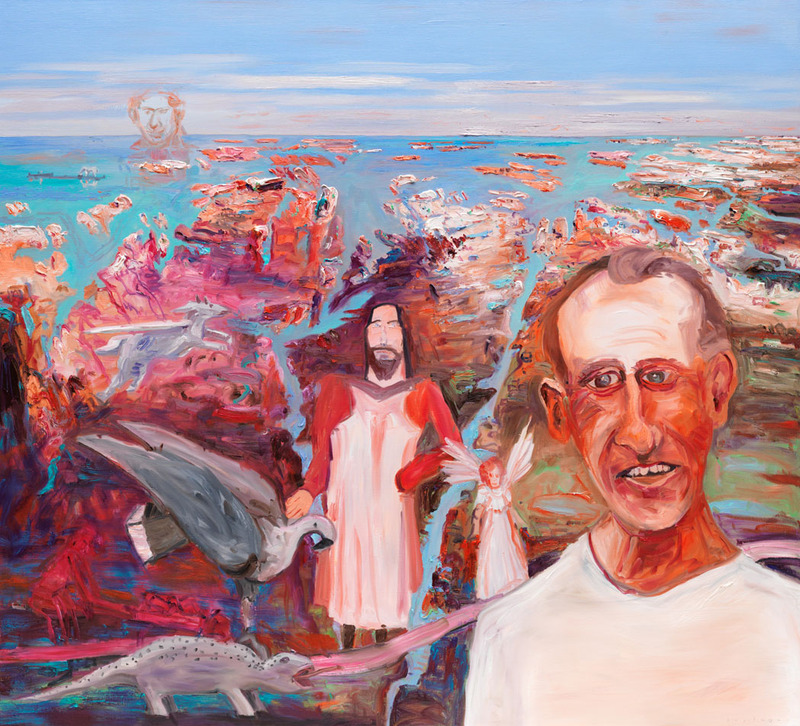 Gilbert is on the right side of this painting and standing beside him is the ten foot high concrete sculpture of God that stood in his garden.